At Jolong Park you’ll capture the very essence of horses all in the one, purpose-built, state-of-the-art equestrian property, which is only a short 30-minute drive from Melbourne. With the primary focus being horses and the secondary, being education, Jolong Park provides six distinct product offerings including: Education, Agistment and Training, Horse World, RTO, Club House and Events. Education is a priority for Jolong Park. Without the basic understanding of horses, it is impossible to move forward with the journey. 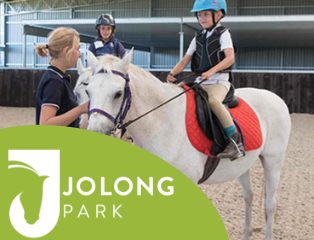 Jolong Park is proud to provide lessons, school holiday programs and equine education programs. Our staff are accredited to ensure you gain and experience the basics of horsemanship skills, and help develop your riding skills further. Here, at Jolong Park, you’ll be able to enjoy, learn and discover. Trail Rides are available from Friday, Saturday and Sunday.